Showtime on Woody After Hours! Fiona and Trish are making their first guest appearance on Woody After Hours today! 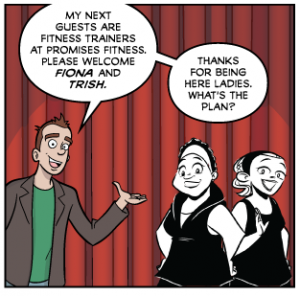 Written by Ben Carter and illustrated by Paul Westover, Woody After Hours is another webcomic about a late night talk show who’s guests are characters from other comics. This week (Mon, Wed, Fri) and into next, the girls will be dishing out some of their best advice and it’s not looking like Woody is going to give them an easy time of it. Just click the pic to follow Fiona and Trish’s television (sort of) debut. We’ll try not to let stardom go to our heads.